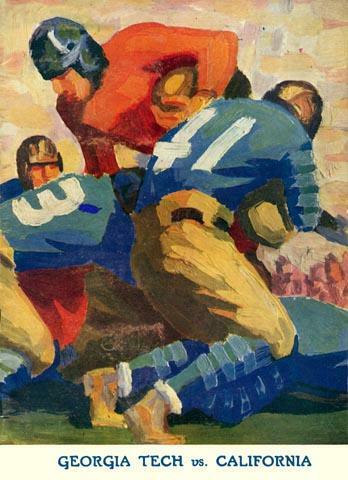 This game not only capped a perfect season for the Yellow Jackets, but it has been passed down in gridiron lore as the famous "Wrong Way Riegels" game. Roy Riegels was an unfortunate California player who in the second quarter scooped up a Georgia Tech fumble on the Tech 30-yard line and headed for the Tech end zone, only to be spun around and misoriented. He then streaked the length of the field in the wrong direction, and wound up being tackled on his own 1-yard line by the Cal player who had caused the fumble in the first place. Three plays later, a Cal punt was blocked in the end zone for a safety, which provided the winning margin in Tech's 8-7 win. It was Tech's only Rose Bowl appearance.